Here I share photos of a few of the new timepieces that I saw during Baselworld 2017, they are all watches I would purchase primarily for their aesthetic styling. Even if 99 percent of the watches talked about here on Quill & Pad by my esteemed colleagues are high-end horology, it might be understandable that my favorites fall into a far more affordable category. However, these watches contain technical elements in terms of materials and engineering that I like. My favorites are neither all Swiss, nor are they mainly French, but interestingly, though not deliberately, are mostly German. The Porsche Design Monobloc Actuator GMT-Chronotimer is a feat of engineering with its rocker button system necessitating several years of testing and engineering by Porsche Design. It was inspired by the Porsche 911 GT RSR race car’s engine mechanics. The GMT-Chronotimer features eight layers of coating on the sapphire crystal to protect it and prevent anything getting in the fractions of millimeters between the rocker bezel that acts as chronograph pushers and the crystal. For more information, see Porsche Design’s New Monobloc Actuator Wristwatch Is Modeled On Porsche 011 RSR and/or visit www.porsche-design.com/en/Timepieces/Monobloc-Actuator/MONOBLOC-Actuator-GMT-Chronotimer-All-Titanium. Those clever chaps in Glashütte continue to make cool watches at reasonable prices in-house. I personally love the new dial colors, with a bright blue and this red/orange (“signalrot”) my favorite by far. For more information on this brand see How Does Nomos Glashütte Make A Beautiful Watch With Manufacture Movement For Under $3,000. Or visit www.nomos-store.com/en/Watches/Model-series/Ahoi/Watches-with-automatic-winding/Ahoi-neomatik-signalrot-sapphire-crystal-back. I was introduced to this collection at Baselworld by Sandro Reginelli, co-founder and CEO, a cool, charismatic Italian Swiss, and I was instantly smitten with the madness of the Tron-style case of this watch with its sapphire crystal viewing windows. For much more information on the Vortex principle, see The Hautlence Vortex: Is This The World’s Slowest Tourbillon? Or visit http://www.hautlence.com/fr/collection/concepts-d-exception/vortex. The HYT H0 is the latest, coolest, and most refined HYT timepiece yet. It comes in several colors and finishes, but the black DLC-coated titanium version with fluorescent green liquid hour display grabbed my attention. I find this watch now more wearable without conventional lugs despite its large case, and the rubber strap is a particularly comfortable presence on the wrist. For more information, visit www.hytwatches.com/collection-h0. I’m a big fan of the Logical One and Romain Gauthier pieces in general, but the Enraged series with its ultra-cool modern case finish reminiscent of an emery board or pumice stone impressed me very much! This piece just has that rock ‘n’ roll, rebel edge as opposed to the usual gold or platinum finishes. The orange accents of this version sealed it for me. To get the Enraged finish, the titanium case is sandblasted, blackened using a PVD (physical vapor deposit) process, and finished off with a protective layer to prevent print marks or fingerprints. For more information, visit www.romaingauthier.com/hour-minute-second. The entire Quill & Pad team thought the pinup illustrations added to the dial of the Chronofighter was cool: four editions each have a different lovely, artistic lady inspired by the 1940s added to the dial. For more information, visit www.graham1695.com/index.php/nose-art. The Salthora Meta X, the so-called “non-diving diver,” continues Meistersinger’s infamous series of one-handed watches, though in this case the single hand is used to measure minutes and seconds instead of the usual hours. The hours here are shown in the jump hour window at 12 o’clock. Seconds markers on a rotating bezel along with the minute markers right on the dial help you to read the time more easily despite the single hand. This beautiful blue dial stood out for me as did the sportier-looking case and chunkier strap. For more information visit www.meistersinger.com/collection/single-hand-watches/salthora-meta-x-1. The Junghans Form A is recognizable through crystal-clear time-telling against the backdrop of a three-dimensional light-colored dial. This watch is classic German style from a classic German brand. For more information, visit www.junghans.de/en/junghans-collection/watches/performance/performance-forma. Sinn’s latest watch is a super cool EZM, designed for the air rescue service. It has a specially treated case and bezel made of scratch-resistant tegimented stainless steel; “tegiment” is Sinn’s own hardening process. EZM also boasts high protection against magnetic fields (up to 80,000 A/m) and temperatures ranging from 80ºC to -45ºC, so it would be useful whether you are trekking across the Arctic or laying on the beach somewhere! The “pulse rotor” measures increments of 15 seconds for accurate heart rate reading. I also enjoy the orange design elements on the watch, from the inner flange to the bezel ring and crown. For more information, visit www.sinn.de/en/Modell/EZM12. A re-discovery for me at Baselworld this year was French brand March LA.B with its 1970s California vibe, which introduced the quartz Seventy model. It has an elegant steel case with a choice of brushed dials. My personal favorite is the gold-colored dial . . . I liked it so much that I purchased one at the show! For more information, visit www.march-lab.com. Emmanuel Dietrich definitely shocked me with this fantastic new watch that is very different to the Organic Time collection that he has been producing for the last few years. This project, which plays with one’s perception of time, is entirely new for the brand. It also requires a more complicated movement that allows the brand to enter a different, higher price range than in the past. For more information, visit www.dietrich.luxury/product-category/watches. I’d also like to give a shout out to the Armin Strom Configurator, which offers custom choices on your favorite models with a selection of options for various movement parts, case, and even strap and stitching colors. You can even get up to three letters engraved on the case lip at 6 o’clock. 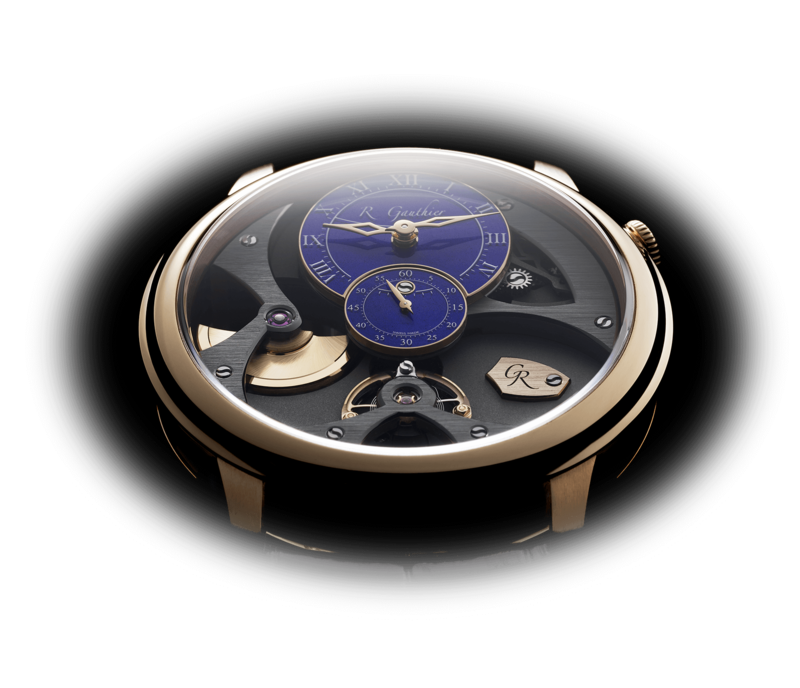 For extensive information on this and how the Quill & Pad team chose their own configurations, see Watch Modding By The Brand: Quill & Pad Team Members Play With The Armin Strom Watch Configurator And Share Their Results.